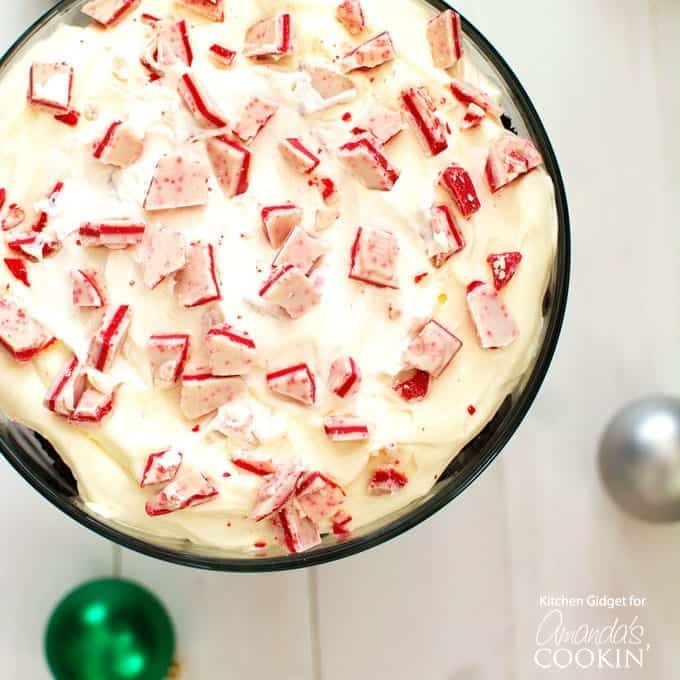 Layers of fudgy chocolate brownies, cheesecake pudding and cool peppermint combine in this festive candy cane inspired trifle dessert. 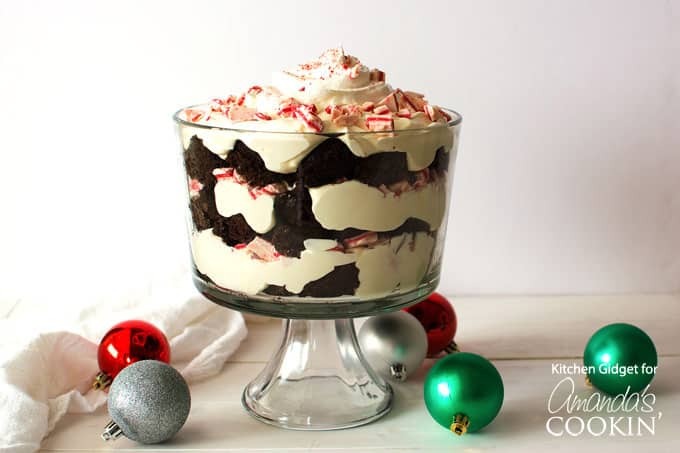 Chocolate peppermint trifle is the easy yet stunning dessert to make this holiday season! You all know how much I love trifles by now. There are several reasons why I think trifle is such a great dessert, first and foremost because they look amazing. While our favorite is still this English Trifle, we love all sorts of layered desserts around here. 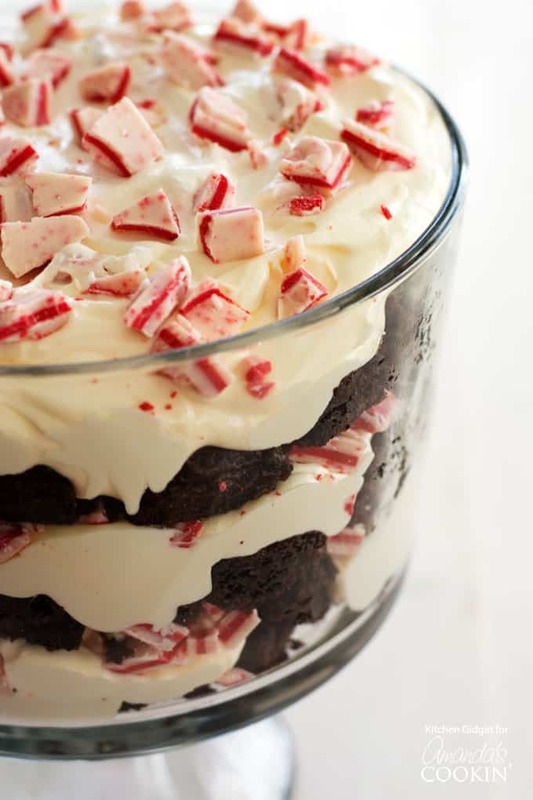 When people see this chocolate peppermint trifle, I guarantee there will be oohs and ahhs throughout the room. It’s a beautiful table centerpiece and definite showstopper! The other reason I love making trifles is because they are so easy. Simply layer your ingredients and you have a magnificent dessert that’s almost effortless. The filling is equally easy using boxed pudding and whipped topping (or homemade whipped cream). Pudding is my secret ingredient in the kitchen! One of my favorite Christmas cookies are pistachio pudding cookies which have a festive green color and soft interior thanks to the pudding. I used cheesecake flavored pudding for this trifle, but vanilla or white chocolate would work just as well. For the peppermint, I used Andes peppermint crunch mints, but Hershey’s also makes a white chocolate bar with crushed candy cane bits. The amount per package varies by brand, but approximately 10-12 ounces is needed. 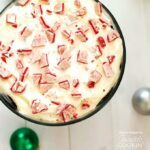 I would not recommend using actual candy canes for this recipe or the flavor will be too overwhelming. Tasters of this dessert say the coolness of the mint keeps this trifle from becoming too rich. They found it refreshing after a full dinner. They also particularly loved the peppermint candy I used since it’s soft and melts in your mouth. 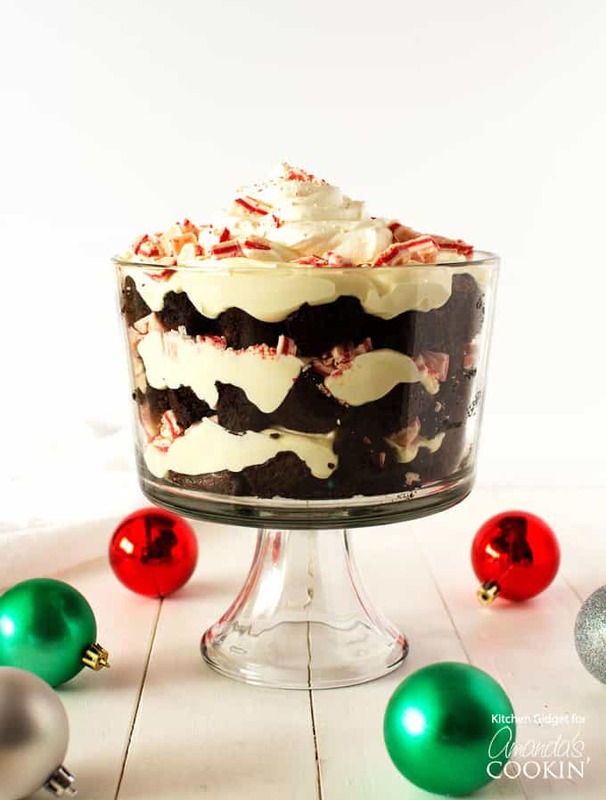 If you love candy cane desserts, you’ll love this homemade peppermint ice cream and this fudgy brownie trifle! In a large mixing bowl, whisk together the pudding mix and milk for 2 minutes. Fold in the whipped topping (may save 1 cup of whipped topping as garnish, if desired). Place mixture in refrigerator while preparing the other ingredients. Cut the brownies into 1-inch cubes. Crush or chop the chocolate into bits, if it they are in large pieces. 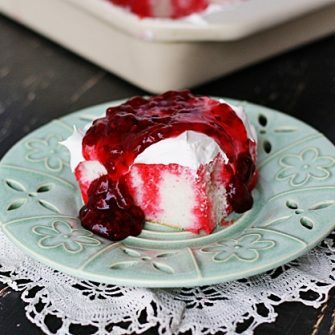 My husband doesn’t like cheesecake.Have you tried this recipe with chocolate pudding instead? We have not, but if you try it we’d love to hear how it goes! Wonderful recipe! I’m back again to make it this holiday season! This was my first time coming to your website and unfortunately, I will not be back. It is too hard to navigate my way through your pages with all the ads and pop ups. I could not print out the recipe I wanted because your pop up to join kept coming up. It took me longer to try to print than it did picking a recipe. As a busy mom, I don’t have time to mess with pages FULL of adds and pop ups. I’m sorry you had trouble Megan – I truly appreciate your feedback and have been considering removing the popup newsletter box. I will take your feedback seriously as I reevaluate things for the new year. I hope you have a good Christmas!